The Professional 5200 has a maximum text plate size of 1" x 1-5/8" (24 x 41 mm) and allows you to create up to 5 lines of customized text. The Trodat Professional 5200 text stamp is the perfect size for multiple office applications: your company address, contact details, accounting or warehouse. 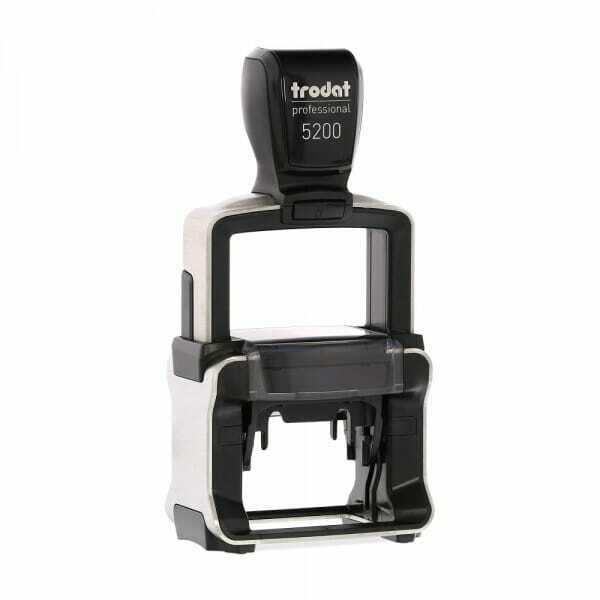 The new Trodat Professional 5200 4.0 self-inking stamp is perfect for everyday use in a busy office environment, thanks to its new brushed stainless steel finish and high quality plastic build. An elegantly designed, self-inking rubber stamp with an integral replaceable ink pad that can be personalized with your own design. The Professional offers the greatest user comfort, as it fits perfectly in the hand thanks to its ergonomically shaped handle. This robust, reliable office stamp is one of Trodat's bestellers, and is climate-neutral with a high content of recycled plastic. Low on ink or want to have extra pads handy? Replacement ink pad 6/50 is available in 5 standard colors: black, blue, red, green or violet. Customer evaluation "Trodat Professional 5200 1" x 1-5/8" - up to 5 lines"
Custom Engraved Sign/Wall Holder Complete- Designer 2" x 10"